3B Theater: Gonzoid Cinema: Gojira! "The ocean just ... blew up!" In honor of the premiere of Godzilla 2000, marking the Big Guy's return to the American movie-plexes after a fifteen-year slumber -- with no Matthew Broderick in sight (and can we all get an amen on that?) 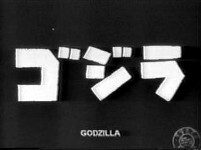 -- I finally decided it was high time to tackle his debut film, both of them, by taking a look at the original Japanese version, Gojira, and the Americanized version, Godzilla: King of the Monsters: two movies which share a lot of the same footage, yes, but are two completely different films. Gojira begins in darkness. Then, slowly, as the pomp and circumstance of Akira Ifukube’s familiar "March of the Monsters" swells over the opening credits, it's infused with the footfalls of something monstrous, punctuated by the most recognizable roar in all monsterdom. (The roar was also Ifukube’s creation, made by rubbing a rubber glove across a stand-up bass' strings.) When said credits expire, we open at sea with the crew the Eiko-maru as they lazily lounge around the deck, seemingly without a care in the world -- he typed ominously ... When suddenly, the ocean around them begins to glow, then boil and churn until a destructive wave of fire crashes over the freighter, engulfing it completely. And all of this happened so fast the ship barely got off a distress signal before it exploded. Since the Eiko-maru was part of the Southern Sea Shipping line, the owners call in Ogata (Akira Takarada), their salvage expert. But Ogata must first break his date with Emiko Yamane (Momoko Kouchi), which he does, before reporting to work. Finding the offices jammed-packed with relatives wanting to know the fate of those on board, Ogata reassures them all a rescue ship has already been dispatched -- and it's almost to the spot where the Eiko-maru went down when the second ship mysteriously explodes, too! 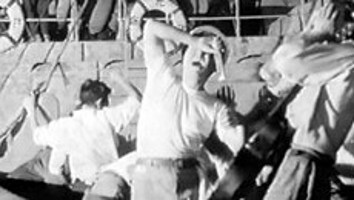 More ships and planes soon follow but only three survivors are found; and once they're picked up, to be taken to the nearest port on Ohto Island, disaster strikes yet again when the ship transporting them never makes it, another victim of these inexplicable maritime calamities. Some fishermen from Ohto do find one survivor among the wreckage, half dead, who claims to have seen a monster. And once he passes out, a cranky old coot proclaims that it must be the mythical Gojira, come alive to eat them all! 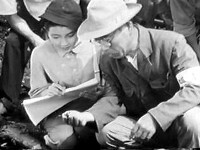 Coming just nine years after the atom bombs fell to end World War II, and directed by a man who witnessed firsthand the destruction and devastation those bombs caused, these, and several other factors and influences converged by chance, circumstance and a little bad luck to create the film Gojira, and launch one of the most storied franchises in all of filmdom. Back in 1954, Tomoyuki Tanaka was an up and coming producer for Toho Motion Picture Company, Japan's premiere movie studio at the time. But when his current project, an Indonesian co-production called Eiko no Katatani, fell apart over some hassles concerning the necessary work-permit visas, Tanaka found himself with a cast, crew and money to spend but no movie to expend them on. 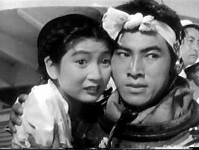 Now, two years prior, the Japanese cinemas had been hit with the original King Kong for the first time; and when that hit big, Warner Bros. quickly sent over their new monster movie, The Beast from 20000 Fathoms, which also raked it in at the box office, making it no small wonder then, when on the flight to Tokyo from Jakarta to break the bad news to his bosses, Tanaka, while looking at the vast Pacific below, began wondering what other beasties might be lurking just below the surface and decided, then and there, that Japan needed a giant monster of its own. 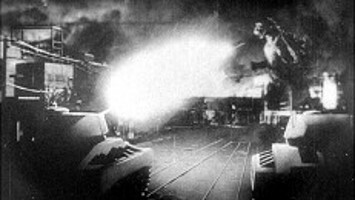 Drawing inspiration from The Lucky Dragon incident, where a Japanese fishing boat wandered too close to the Bikini Atoll and got a massive dose of radiation from the recent H-Bomb tests, igniting a firestorm of controversy worldwide, Tanaka's premise was to have an ancient creature awakened by these same tests, who would then wreak havoc on mankind as way for nature to exact revenge for dabbling to far into its inherent mysteries. Tanaka's boss, Iwao Mori, was sold, and Kaitei Niman Mairu Kara Kita Dai Kaiju, roughly translated, The Big Monster from 20000 Miles from Beneath the Sea, was given the green light. Known simply as "G" -- for giant -- during production, the legend goes that while searching for a proper title, Tanaka liked the sound of a nickname for a burly press agent, a combination of the words gorira (gorilla) and kujira (whale); it stuck, and the rest is cinematic history. 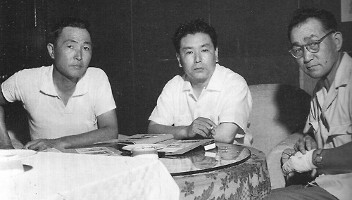 To direct, Tanaka turned to Akira Kurwasawa's assistant director, Ishirô Honda, who brought a lot of his own ideas to the project; and it was his notion to make the monster indestructible, making it a true manifestation of the bomb; and he also added the doomed hero, Serizawa, when he and Tanaka took over the script after several drafts failed to capture what they wanted. For the F/X, when the stop-motion option was deemed both too expensive and time-consuming, veteran artist Eiji Tsuburaya was brought in to oversee the creation of the monster-suit and the miniatures it was destined to destroy. Settling on a combination of a T-Rex and a Stegosaurus, the heavy and cumbersome costume was worn by stuntman Haruo Nakajima; and to give the monster a larger sense of scale, he had to be filmed at a slower speed and with double the lights, causing the overheated actor to faint on several occasions. The process seems simple enough on screen, but the effort and coordination expended to pull these scenes off have been unjustly maligned and given the short-shrift over the years and is a terrible insult if you'd just take the time to look a little closer at all the details involved. After the storm lifts, the surviving village elders are hauled to the mainland to testify before a government committee. After relating the mass destruction that has befallen them to the gathered politicians, they all state, most definitely, it was no hurricane that destroyed their village. Calling in an expert, a Dr. Kyohei Yamane (Takashi Shimura), Japan’s most eminent zoologist -- and also Emiko's dad -- compares the villager's claims of a monster to the mystery of the abominable snowman. Seeing a rare opportunity for scientific discovery, he volunteers to go to the island and investigate. When the expedition sets sail for Ohto, on board are the Yamanes, Ogata and Hagiwara. (Brave souls all, considering what’s happened to every other boat that’s ventured into that area.) During the voyage, we see that Ogata and Emiko are truly in love. The only problem is, she has promised to wed another man: a Dr. Daisuke Serizawa (Akihiko Airata). 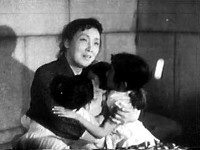 We then learn this engagement happened before the war, but during said war, Serizawa was badly injured, and after, became somewhat of a bitter recluse. The two never did get married, and probably never will, but Emiko hasn’t officially broken it off with him yet. Meanwhile, Ogata has his own problems; he must get consent from the elder Yamane -- who arranged his daughter's marriage with Serizawa -- before they can even think about getting married ... and so are the Days of Our Lives. Upon arrival, the expedition finds the coastal village in ruins and detect traces of radioactivity everywhere. 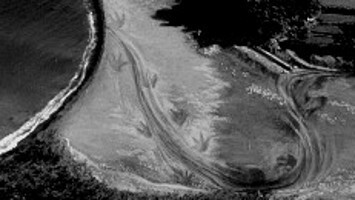 After a cursory examination, Yamane believes all the deep impressions they find are actually the footprints of some unknown beast. He also finds a trilobite -- a parasite that was thought to be extinct. Suddenly, their investigation is rudely interrupted when a warning bell is sounded. Hearing the huge footfalls that probably caused all the damage, they head for the safety of the hills -- but find they're fleeing in the wrong direction when Gojira pops his head up over the crest they're climbing! After an abrupt about face, most flee in abject terror but a few brave souls like Hagiwara manage to snap some pictures of the monster before it retreats back into the sea ... Then it's back to the mainland to appear before another committee. 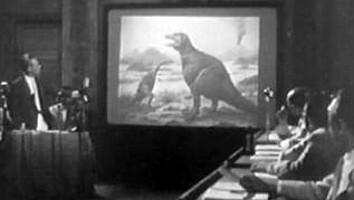 Presenting his startling evidence, Yamane postulates that Gojira is a living dinosaur that survived over the eons deep in the ocean. He also believes, due to its immense radioactivity, the recent hydrogen bomb tests are responsible for driving it to the surface. This wild hypothesis triggers a real nasty argument between two officials on whether to inform the public of Gojira’s existence or to keep it a secret. (We’ve got to close the beaches!) Amazingly, the politicians decide to go public, close down all major shipping lanes, and begin concentrating on finding a way to kill the monster as soon as possible. Starting with the most direct approach first, an armada of "Anti-Gojira" frigates are dispatched; and as they depth-charge the heck out of the ocean around Ohto, we get several different viewpoints from several different people over what is the best course of action on dealing with the threat: on a passenger train, John and Jane Doe argue about the monster, where Jane states she didn’t survive Nagasaki just to be eaten by Gojira; Yamane, on the other hand, thinks they should save Gojira for scientific study; and Hagiwara believes the monster should be destroyed before it can cause any more damage. Almost on cue, Gojira surfaces in Tokyo harbor, scares the hell out of some cruise ship passengers, but doesn’t attack; he just sniffs around a bit, and then submerges back into the water. With the direct approach not really working, the government asks Yamane if he can think of anything that can kill Gojira. Alas, the doctor fears the monster has absorbed so much radiation that it's virtually indestructible. He also still firmly believes they should save and study this one of a kind creature. 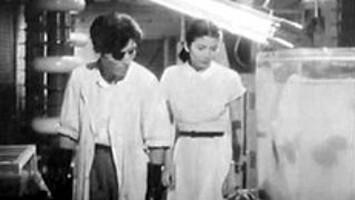 Meanwhile, Hagiwara receives a tip that a Dr. Serizawa has made a major breakthrough in a weapon to fight off Gojira. Asked to go with him for the interview, Emiko agrees and also promises Ogata that she will finally tell Serizawa about them and break off their long engagement. But Serizawa denies the weapon rumors. In fact: he won’t talk about his research at all. Frustrated, Hagiwara soon leaves, but he should have stuck around. Seems Serizawa does have a secret discovery, and he has decided to show it to Emiko. Taking her to his basement lab, he puts a small dose of a chemical powder into an aquarium, teeming with fish. He then throws an electrical charge into the water, and as Emiko watches the violent reaction, she soon recoils in horror and quickly turns away. (What happened? We don’t know. Yet.) Perhaps regretting his decision, Serizawa swears her to secrecy. When Gojira surfaces again, this time, the monster comes ashore and tries to eat a train. Finding this unappetizing, he stomps around a bit more, smashing several districts before returning to the sea. With things rapidly escalating, an international task-force is assembled to combat the Gojira threat. But the best they can come up with is to evacuate the coast and put up a huge electrical fence, hoping it will keep the monster out. While all of this implemented, Yamane's foul mood only worsens over these developments; and Ogata makes the mistake of picking that exact moment to ask permission to marry Emiko. Instead, they argue about Gojira, and since Ogata thinks the monster should be destroyed, an enraged Yamane kicks him out. (Oops.) And before Ogata can try to apologize, Gojira attacks again and makes quick work of the electric fence. Like the ancient dragons of old, the beast uses his fiery atomic blasts to set the whole city ablaze. And this time, he sticks around for a while, stomping and crushing the things that he doesn’t set on fire, cutting a wide swath of destruction until the Japanese Air Force drives him off. Yes, you read that right -- the military managed to drive the monster away. Together, the couple begs Serizawa to use this invention against Gojira, but he adamantly refuses to let his deadly creation be revealed to the world. And now, with the secret out, Serizawa begins to destroy his notes and records. When Ogata tries to stop this, they fight until Emiko separates them, and then rushes to the battered Ogata’s aid. Seeing there is something between them and that he's out of the picture, Serizawa goes into a big speech about why he can’t use the Oxygen Destroyer. (That I'll go into greater detail later.) But then they overhear a televised national prayer for deliverance given by the children of Japan, and the children's desperate cry for help finally sways Serizawa. He will use the Oxygen Destroyer -- but just this once, and only once, -- and then proceeds to finish destroying all of his notes to guarantee this claim. 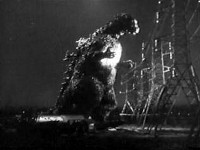 Using Geiger counters, the Navy determines Gojira’s location -- the monster is sleeping at the bottom of the Tokyo Bay. 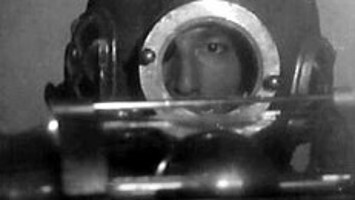 Soon enough, Ogata's salvage boat floats directly above him. Since there's only one Oxygen Destroyer, Serizawa demands to go down with Ogata; and since he's the only one who knows how to trigger it properly, Ogata begrudgingly agrees and they both suit up. When they reach the bottom and find the slumbering giant, Ogata gives the signal to haul them up. And he’s halfway home before realizing that Serizawa is still at the bottom, where he activates the Oxygen Destroyer, which reacts violently with water. After Ogata surfaces, he orders the others to pull Serizawa up. Calling to him over the radio, as the others plead with him to surface, Serizawa tells Emiko to be happy, and then cuts his tow-line and air-hose, guaranteeing his invention will never be used for evil intent and its secrets will die with him. Along with Serizawa, Gojira is consumed in the reaction: the monster surfaces briefly, and gives off one final mournful roar. 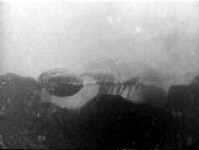 But even as his skeletonized remains hit the bottom and vaporize, Yamane warns there are probably other Gojira’s lurking in the ocean, and with all the nuclear bomb tests going on, it won’t be long until another one surfaces. I’ve been a Godzilla fanatic for over twenty-five years, and I’m kind of ashamed to admit this, but it wasn’t until late last year (-- for the record, 1999 --) that I finally tracked down and watched the original Japanese version, Gojira. Now, the main difference between the two versions of the film is that the love triangle between Emiko, Ogata and odd-man out Serizawa is more pronounced in this version. And there's also the subplot of Dr. Yamane wanting to study the creature, instead of destroying it, that is completely absent from Godzilla: King of the Monsters. And of course, Raymond Burr is gone, and seeing the original in its original sequence was a tad disjointing after having seen the Americanized version so many times. You see, when it was imported to the States in 1956, the film was torn asunder and then spliced back together so the monster showed up sooner, and the boring romantic interludes were left on the edit room floor. Also lost in those cuts and inserts was the overall somber tone of the piece and the muddling of it's message. It doesn't take a genius to see the monster in Gojira as a metaphor for the horrors of the nuclear age. And as a viewer, if you really wanted to, you could probably take that message, tuck it in your pocket and go on your merry way, but I think there's a whole lot more going on than mankind's imminent self-destruction in this particular morality play. To me, the real villain of the piece is Serizawa's Oxygen Destroyer, and it's with this deadly invention where the real message of the movie can be found. Yes, that's right: my contention is the Oxygen Destroyer -- not Gojira -- that is the real monster of this picture. Look at the evidence: feeling that he can someday find a productive use for it to benefit mankind, but until then, Serizawa is so terrified of his creation that he keeps it a closely guarded secret. As it is now, in it’s raw form, the elements can only be used as a weapon of mass destruction, making the correlation between the Oxygen Destroyer and the atomic bombs used to end World War II a no-brainer. When scientists and engineers first started messing around with energy on the atomic level, atomic fission was the first big breakthrough. Splitting the atom released a huge amount of energy, albeit destructive, and it had a ton of harmful side-effects like radiation. And in the deserts of New Mexico, where it's potential application became all too terrifyingly real, I think Gojira makes the argument that perhaps Oppenheimer and his crew should have kept it a secret until it could be successfully harnessed for non-destructive purposes. History proves that they didn't, and ever since the atomic genie was let out of the bottle, where it has since proliferated, the world has lived in constant fear of being reduced to a radioactive cinder. To steal a phrase from uncle Ben Parker: "With great power, comes great responsibility" -- that is the message that Gojira brings out to me, loud and clear. 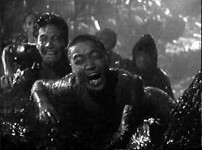 In the film, Serizawa reinforces this contention when he states that we are in the shadows of bombs and missiles, and how the world is on the brink of Armageddon. Afraid that his creation will tip the scales and plunge the world into war -- the final war, he wants no part of it and is content to sit on the sidelines. But in the end, after seeing the destruction Gojira has caused, Serizawa breaks down and decides to use the Oxygen Destroyer to prevent any more and to save countless lives. And it should be noted that the same cold logic was used to justify the bombings of Hiroshima and Nagasaki, but what makes Serizawa different than the gang at the Manhattan Project -- whose mess, in a sense, he is cleaning up -- is that he alone knew the secret of his creation, and knowing it's horrific potential, he does the honorable thing by destroying his notes and committing suicide so his Oxygen Destroyer could never be made again. Thus the world will never have to live in fear of it. 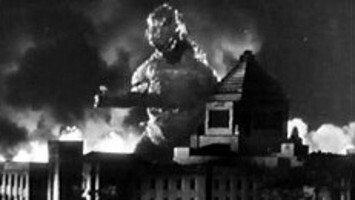 All told, Gojira is very somber affair with definite anti-nuclear feelings, and, unlike its American counterpart, is more about its ideas and characters than its title monster. With all that said, if you haven't read it yet, let’s go take a look at the Americanized version, and see what else they left out.